Our authentic Wine Barrel Lids are made from American or French Oak. A unique wall feature, servery or turned into a Lazy Susan as a decorative piece. Bargain Barrel takes the time to apply extra glue and dowel to provide additional strength to each oak piece. Authentic oak lids show a lot of movement, this service will prevent the oak lid from falling apart. 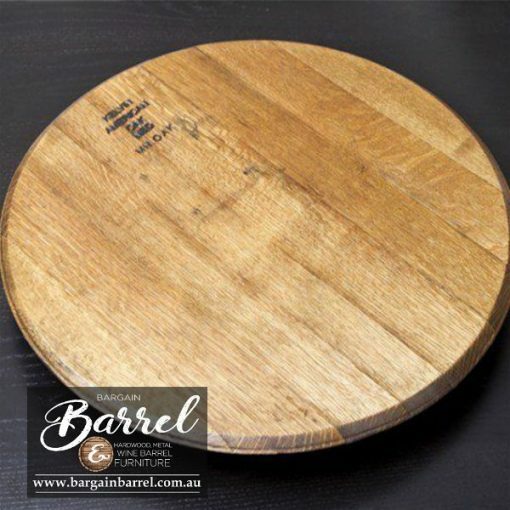 If customers don’t require the oak lid to be a solid piece with no movement, then please visit Oak Lid Plain (Loose). No hanging mechanism supplied at this price. Customers wanting a personal Oak Lid Logo with personal laser cut logo design, please find time to visit the following link for further information, Oak Lid Logo.